Stephen Mitchell—the renowned translator of the Tao Te Ching—selected provocative excerpts from that ancient text as a stimulus for Katie to talk about the most essential issues that face us all: life and death, good and evil, love, work, and fulfillment. The result is a book that allows the timeless insights of the Tao Te Ching to resonate anew for us today, while offering a vivid and illuminating glimpse into the life of a someone who for twenty-one years—ever since she “woke up to reality” one morning in 1986—has been living what Lao-tzu wrote more than 2,500 years ago. Katie’s profound, lighthearted wisdom is not theoretical; it is absolutely authentic. It’s a portrait of a woman who is imperturbably joyous, whether she is dancing with her infant granddaughter or finds that her house has been emptied out by burglars, whether she stands before a man about to kill her or embarks on the adventure of walking to the kitchen, whether she learns that she is going blind, flunks a “How Good a Lover Are You?” test, or is diagnosed with cancer. With its stories of total ease in all circumstances, Katie does more than describe the awakened mind; she lets you see it, feel it, in action. And she shows you how that mind is yours as well. This book is a portrait of the awakened mind in action. 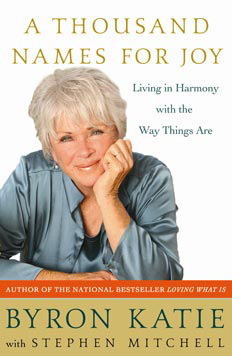 It is also Byron Katie’s response to the Tao Te Ching (pronounced Dow De Jing), the great Chinese classic that has been called the wisest book ever written. Lao-tzu, the author of the Tao Te Ching, may have lived in the sixth century BCE, or he may be entirely legendary. I like to imagine him in frayed robes, an old man with a wispy beard, who spends much of his time in delighted silence, always available to people, serenely observing the infinite ways in which they make themselves unhappy. In many chapters of the Tao Te Ching, Lao-tzu describes himself through a figure called “the Master,” the mature human being who has gone beyond wisdom and holiness to a world-including, world-redeeming sanity. There’s nothing mystical or lofty about the Master. He (or she) is simply someone who knows the difference between reality and his thoughts about reality. He may be a mechanic or a fifth-grade teacher or the president of a bank or a homeless person on the streets. He is just like everyone else, except that he no longer believes that in this moment things should be different than they are. Therefore in all circumstances he remains at ease in the world, is efficient without the slightest effort, keeps his lightness of heart whatever happens, and, without intending to, acts with kindness toward himself and everyone else. He is who you are once you meet your mind with understanding. I discovered that when I believed my thoughts, I suffered, but that when I didn’t believe them, I didn’t suffer, and that this is true for every human being. Freedom is as simple as that. I found that suffering is optional. I found a joy within me that has never disappeared, not for a single moment. That joy is in everyone, always. Soon afterward, rumors arose about a “lit lady” in Barstow, and people started seeking her out, asking how they could find the freedom that they saw shining in her. She became convinced that what they needed, if anything, was not her personal presence, but a way to discover for themselves what she had realized. Katie’s method of self-inquiry, which she calls The Work, is an embodiment, in words, of the wordless questioning that had woken up in her on that February morning. It is a simple yet extremely powerful method and requires nothing more than a pen, paper, and an open mind. As reports spread about the remarkable transformations that people were experiencing through The Work, Katie was invited to present it publicly elsewhere in California, then throughout the United States, and eventually in Europe and across the world. She has been traveling for fifteen years now, sometimes nonstop, and has brought The Work to hundreds of thousands of people at free public events, in prisons, hospitals, churches, corporations, battered women’s facilities, universities and schools, at weekend intensives, and at her nine-day School for The Work. Katie doesn’t know much about spiritual classics; in fact, before we met, she had never even heard of the Tao Te Ching. But she does know about joy and serenity, and she knows about the mind: how it can make us miserable, how we can use it to get free. So, from her point of view, Lao-tzu is a colleague, someone who has the same job, someone to have a conversation with, never mind that he’s dead. This book is that very interesting conversation. Proceeding, like the Tao Te Ching, as variations on a theme, it expresses the same fundamental realization in many ways, under many circumstances. Eventually I read her my version of the Tao Te Ching, all eighty-one chapters of it, and wrote down her responses, which were the raw material for this book. Sometimes, at my prompting, she would respond to every line; often she would focus on one passage, or elaborate on just a few lines. (The epigraphs that begin each of the following chapters quote the lines from the Tao Te Ching that are most relevant to what she is talking about.) Along the way, I would ask her to refine or expand upon something in the text, or I would point her in a particular direction that seemed helpful. Sometimes she had no reference for a question, and I felt as if I were asking a fish what it’s like to live in water. I suggested the specifics for “beautiful” and “ugly” in chapter 2, for example, since I adore Mozart and I don’t yet appreciate rap. It’s useful that I have these strong likes and dislikes; it gives Katie a reference for concepts such as “noise,” which are outside her experience of reality. I have known the Tao Te Ching since 1973, and with particular intimacy since 1986, when I wrote my version. I respect it as much as any book in the world, I owe it a great deal, and I know its power. (A friend told me that when he was in emotional trouble as a young man, what saved him was that he read my version from cover to cover—notes included—every single day for a whole year.) It’s wonderful to discover that there is such a thing as a manual on the art of living, a book this wise and this practical. But it is one thing to read about being in harmony with the way things are, or even to understand what that means, and quite another to actually live it. Even the wisest of books can’t give us its wisdom. After we have read the profound insights and nodded our heads—“Stop trying to control,” “Be completely present,” “See the world as your self,” “Let go,” “Have faith in the way things are”—the central question remains: But how? How can we learn to do that? Katie has written two books that show how to end suffering by questioning the thoughts that create it, the thoughts that argue with reality. No one knows how to let go, but anyone can learn exactly how to question a stressful thought. When you’re feeling upset, for example, and it seems impossible to let go of that feeling, you can question the thoughts that say, “I’m not safe,” “I can’t do this,” “She shouldn’t have left me,” “I’m too fat,” “I need more money,” “Life is unfair.” After that questioning, you can’t ever be the same. You may end up doing something or doing nothing, but however life unfolds, you’ll be coming from a place of greater confidence and peace. And eventually, once your mind becomes clear, life begins to live itself through you, effortlessly, with the joy and kindness that Lao-tzu points us toward. Though reality itself is unnamable, Katie says, there are a thousand names for joy, because nothing is separate, and joy, deep down, is what we all are. Questioning thoughts that seem to be true—thoughts that may even feel like part of our identity—takes courage, and in A Thousand Names for Joy Katie gives readers the powerful encouragement of seeing, in detail, the freedom that lives on the other side of inquiry. As you may have realized already, this book is more than a commentary on the Tao Te Ching. It is a glimpse into the depths of being, and into the life of a woman who for twenty years has been living what Lao-tzu wrote. The profound, lighthearted wisdom that it embodies is not theoretical; it is absolutely authentic. That is what makes the book so vivid and compelling. It’s a portrait of a woman who is imperturbably joyous, whether she is dancing with her infant granddaughter or finds that her house has been emptied out by burglars, whether she stands before a man about to kill her or embarks on the adventure of walking to the kitchen, whether she learns that she is going blind, flunks a “How Good a Lover Are You?” test, or is diagnosed with cancer. With its stories of total ease in all circumstances, it doesn’t merely describe the awakened mind; it lets you see it, feel it, in action. You may believe that although freedom was attainable thousands of years ago by a few enlightened masters, such a state is beyond the reach of anyone living in the modern world, and certainly beyond you. A Thousand Names for Joy has the power to change that belief. Note: “Tao Te Ching” is shorthand for my book Tao Te Ching: A New English Version. You don’t need to know anything about it in order to enjoy A Thousand Names for Joy. But even though this book is meant to be read as an independent text, each chapter relates to the corresponding chapter in my Tao Te Ching, and it’s instructive to read them side by side. You can’t express reality in words. You limit it that way. You squeeze it into nouns and verbs and adjectives, and the instant-by-instant flow is cut off. The tao that can be told isn’t the eternal Tao, because trying to tell it brings it into time. It’s stopped in time by the very attempt to name it. Once anything is named, it’s no longer eternal. “Eternal” means free, without limit, without a position in time or space, lived without obstacle. There’s no name for what’s sitting in this chair right now. I am the experience of the eternal. Even with the thought “God,” it all stops and manifests in time, and as I create “God,” I have created “not-God.” You can substitute anything here—with the thought “tree,” I create “tree” and “not-tree”; the mechanism is the same. Before you name anything, the world has no things in it, no meaning. There’s nothing but peace in a wordless, questionless world. It’s the space where everything is already answered, in joyful silence. In this world before words, there is only the real—undivided, ungraspable, already present. Any apparently separate thing can’t be real, since the mind has created it with its names. When we understand this, the unreal becomes beautiful, because there’s nothing that can threaten the real. I don’t ever see anything separate called “tree” or “you” or “I.” These things are only imagination, believed or unbelieved. Naming is the origin of all the particular things that make up the world of illusion, the dream world. To break off part of the everything and name it “tree” is the first dream. I call it “first-generation thinking.” Then thought begets thought, and we have “tall tree, beautiful tree, tree that I want to sit under, tree that would make good furniture, tree that I need to save,” and the dream goes on and on. It takes a child just a moment to fall into the dream world, the dream of a world, when she first connects word with thing. And it takes you just a moment to question it, to break the spell and be grateful for the Tao of everything—tree, no tree; world, no world. When the mind believes what it thinks, it names what cannot be named and tries to make it real through a name. It believes that its names are real, that there’s a world out there separate from itself. That’s an illusion. The whole world is projected. When you’re shut down and frightened, the world seems hostile; when you love what is, everything in the world becomes the beloved. Inside and outside always match—they’re reflections of each other. The world is the mirror image of your mind. Not believing your own thoughts, you’re free from the primal desire: the thought that reality should be different than it is. You realize the wordless, the unthinkable. You understand that any mystery is only what you yourself have created. In fact, there’s no mystery. Everything is as clear as day. It’s simple, because there really isn’t anything. There’s only the story appearing now. And not even that. In the end, “mystery” is equal to “manifestations.” You’re just looking from a new perspective. The world is an optical illusion. It’s just you, crazed and miserable, or you, delighted and at peace. In the end, “desire” is equal to “free from desire.” Desire is a gift; it’s about noticing. Everything happens for you, not to you. I have questioned my thoughts, and I’ve seen that it’s crazy to argue with what is. I don’t ever want anything to happen except what’s happening. For example, my ninety-year-old mother is dying of pancreatic cancer. I’m taking care of her, cooking and cleaning for her, sleeping beside her, living in her apartment twenty-three hours a day (my husband takes me out for a walk every morning). It has been a month now. It’s as if her breath is the pulse of my life. I bathe her, I wash her in the most personal places, I medicate her, and I feel such a sense of gratitude. That’s me over there, dying of cancer, spending my last few days sleeping and watching TV and talking, medicated with the most marvelous painkilling drugs. I am amazed at the beauty and intricacies of her body, my body. And the last day of her life, as I sit by her bedside, a shift takes place in her breathing, and I know: it’s only a matter of minutes now. And then another shift takes place, and I know. Our eyes lock, and a few moments later she’s gone. I look more deeply into the eyes that the mind has vacated, the mindless eyes, the eyes of the no-mind. I wait for a change to take place. I wait for the eyes to show me death, and nothing changes. She’s as present as she ever was. I love my story about her. How else could she ever exist? A man sticks a pistol into my stomach, pulls the hammer back, and says, “I’m going to kill you.” I am shocked that he is taking his thoughts so seriously. To someone identified as an I, the thought of killing causes guilt that leads to a life of suffering, so I ask him, as kindly as I can, not to do it. I don’t tell him that it’s his suffering I’m thinking of. He says that he has to do it, and I understand; I remember believing that I had to do things in my old life. I thank him for doing the best he can, and I notice that I’m fascinated. Is this how she dies? Is this how the story ends? And as joy continues to fill me, I find it miraculous that the story is still going on. You can never know the ending, even as it ends. I am very moved at the sight of sky, clouds, and moonlit trees. I love that I don’t miss one moment, one breath, of this amazing life. I wait. And wait. And in the end, he doesn’t pull the trigger. He doesn’t do that to himself. What we call “bad” and what we call “good” both come from the same place. The Tao Te Ching says that the source of everything is called “darkness.” What a beautiful name (if we must have a name)! Darkness is our source. In the end, it embraces everything. Its nature is love, and in our confusion we name it terror and ugliness, the unacceptable, the unbearable. All our stress results from what we imagine is in that darkness. We imagine darkness as separate from ourselves, and we project something terrible onto it. But in reality, the darkness is always benevolent. What is the “darkness within darkness”? It’s the mind that doesn’t know a thing. This don’t-know mind is the center of the universe—it is the universe—there’s nothing outside it. The reason that darkness is the gateway to all understanding is that once the darkness is understood, you’re clear that nothing is separate from you. No name, no thought, can possibly be true in an ultimate sense. It’s all provisional; it’s all changing. The dark, the nameless, the unthinkable—that is what you can absolutely trust. It doesn’t change, and it’s benevolent. When you realize this, you just have to laugh. There’s nothing serious about life or death. she stays serenely in herself. Who would you be in people’s presence without, for example, the story that anyone should care about you, ever? You would be love itself. When you believe the myth that people should care, you’re too needy to care about people or about yourself. The experience of love can’t come from anyone else; it can come only from inside you. I was once walking in the desert with a man who began to have a stroke. We sat down, and he said, “Oh, my God, I’m dying. Do something!” He was talking through one side of his mouth because the other side had become paralyzed. What I did was just sit there beside him, loving him, looking into his eyes, knowing that we were miles from a phone or car. He said, “You don’t even care, do you?” I said, “No.” And through his tears, he started to laugh, and I did too. And eventually his faculties returned; the stroke had come to pass, not to stay. This is the power of love. I wouldn’t leave him for a caring. When something feels right I do it; I live my life out of that caring. That’s how I contribute to life: by picking up the trash on the sidewalk, recycling, sitting with the homeless, sitting with the wealthy, helping people who are deeply confused question their thinking. I love what is and how it changes through my hands and yours. It’s wonderful to be so available to change what I can, and for it to be effortless, always. Some people think that compassion means feeling another person’s pain. That’s nonsense. It’s not possible to feel another person’s pain. You imagine what you’d feel if you were in that person’s shoes, and you feel your own projection. Who would you be without your story? Pain-free, happy, and totally available if someone needs you—a listener, a teacher in the house, a Buddha in the house, the one who lives it. As long as you think there’s a you and a me, let’s get the bodies straight. What I love about separate bodies is that when you hurt, I don’t—it’s not my turn. And when I hurt, you don’t. Can you be there for me without putting your own suffering between us? Your suffering can’t show me the way. Suffering can only teach suffering. The Buddhists say that it’s important to recognize the suffering in the world, and that’s true, of course. But if you look more deeply, even that is a story. It’s a story to say that there is any suffering in the world. Suffering is imagined, because we haven’t adequately questioned our thoughts. I am able to be present with people in extreme states of torment without seeing their suffering as real. I’m in the position of being totally available to help them see what I see, if that’s what they want. They’re the only ones who can change, but I can be present, with kind words and the power of inquiry. It’s amazing how many people believe that suffering is a proof of love. “If I don’t suffer when you suffer,” they think, “it means that I don’t love you.” How can that possibly be true? Love is serene; it’s fearless. If you’re busy projecting what someone’s pain must feel like, how can you be fully present with her? How can you hold her hand and love her with all your heart as she moves through her experience of pain? Why would she want you to be in pain too? Wouldn’t she rather have you present and available? You can’t be present for people if you believe that you’re feeling their pain. If a car runs over someone and you project what that must feel like, you’re paralyzed. But sometimes in a crisis like that, the mind loses its reference, it can’t project anymore, you don’t think, you just act, you run over and pick up the car before you have time to think This isn’t possible. It happens in a split second. Who would you be without your story? The car is up in the air. Sadness is always a sign that you’re believing a stressful thought that isn’t true for you. It’s a constriction, and it feels bad. Conventional wisdom says differently, but the truth is that sadness isn’t rational, it isn’t a natural response, and it can’t ever help you. It just indicates the loss of reality, the loss of the awareness of love. Sadness is the war with what is. It’s a tantrum. You can experience it only when you’re arguing with God. When the mind is clear, there isn’t any sadness. There can’t be. If you move into situations of loss in a spirit of surrender to what is, all you experience is a profound sweetness and an excitement about what can come out of the apparent loss. And once you question the mind, once the stressful story is seen for what it is, there’s nothing you can do to make it hurt. You see that the worst loss you’ve experienced is the greatest gift you can have. When the story arises again—“She shouldn’t have died” or “He shouldn’t have left”—it’s experienced with a little humor, a little joy. Life is joy, and if you understand the illusion arising, you understand that it’s you arising, as joy. What does compassion look like? At a funeral, just eat the cake. You don’t have to know what to do. It’s revealed to you. Someone comes into your arms, and the kind words speak themselves; you’re not doing it. Compassion isn’t a doing. Whether or not you’re suffering over their suffering, you’re standing or you’re sitting. But one way you’re comfortable, the other way you’re not. You don’t have to feel bad to act kindly. On the contrary: the less you suffer, the kinder you naturally become. And if compassion means wanting others to be free of suffering, how can you want for others what you won’t give to yourself? My husband read me an interview with a well-known Buddhist teacher in which he describes how appalled and devastated he felt while watching the planes hit the World Trade Center on September 11, 2001. While this reaction is very popular, it is not the reaction of an open mind and heart. It has nothing to do with compassion. It comes from believing unquestioned thoughts. He believed, for example, “This shouldn’t be happening” or “This is a terrible thing.” It was thoughts like these that were making him suffer, not the event itself. He was devastating himself with his unquestioned thoughts. His suffering had nothing to do with the terrorists or the people who died. Can you take this in? Here was a man dedicated to the Buddha’s way—the end of suffering—who in that moment was terrorizing his own mind, causing his own grief. I felt compassion for people who projected fearful meanings onto that picture of a plane hitting a building, who killed themselves with their unquestioned thoughts and took away their own state of grace. The end of suffering happens in this very moment, whether you’re watching a terrorist attack or doing the dishes. And compassion begins at home. Because I don’t believe my thoughts, sadness can’t exist. That’s how I can go to the depths of anyone’s suffering, if they invite me, and take them by the hand and walk them out of it into the sunlight of reality. I’ve taken the walk myself. I’ve heard people say that they cling to their painful thoughts because they’re afraid that without them they wouldn’t be activists for peace. “If I felt completely peaceful,” they say, “why would I bother taking action at all?” My answer is “Because that’s what love does.” To think that we need sadness or outrage to motivate us to do what’s right is insane. As if the clearer and happier you get, the less kind you become. As if when someone finds freedom, she just sits around all day with drool running down her chin. My experience is the opposite. Love is action. It’s clear, it’s kind, it’s effortless, and it’s irresistible. As you lose the filter that I call a story, you begin to see reality as it is: simple, brilliant, and kinder than you could have imagined. There’s a resonance that doesn’t ever leave the center. You come to honor it, because you realize that you have no authentic life outside it. Wherever you stand, you’re in the center of the universe. There’s neither big nor small. Galaxies and electrons exist only in your own perception. Everything revolves around you. Everything goes out from you and returns to you. This may seem like selfishness. But it’s the opposite of selfishness: it’s total generosity. It’s love for everyone and everything you meet, because you’ve been enlightened to yourself. There’s nothing kinder than knowing you’re It. The awareness of your own self—the only self that has ever existed or ever will exist—leaves you automatically centered. You become your own love affair. You’re self-amazed, self-delighted. You’re all alone, forever. Don’t you love it? Look at your beautiful self! I used to believe that there was a you and a me. Then I discovered that there’s no you, that in fact you are me. There aren’t two to take care of, or three, or four, or a billion. There’s only one. The relief of that! It’s enormous! “You mean there’s nothing to do? That if I’m okay, everything is okay?” Yes, that’s exactly it. It’s self-realization. Everything falls sweetly, effortlessly, into your lap. You’re not only the center, you’re the circumference. You’re the whole circle, and you’re everything outside the circumference too. Nothing can limit or circumscribe you. You’re all of it. You’re all that you can possibly imagine—inside, outside, up, down. Nothing exists that doesn’t come out of you. Do you understand? If it doesn’t come out of you, it cannot exist. What are you manifesting? Stars? Universes? A tree? A bird? A stone? Well, who is the thinker? Take a look: Did anything exist before you thought it? When you’re asleep and not dreaming, where is the world? When I first realized there was only me, I began to laugh, and the laughter ran deep. I preferred reality to denial. And that was the end of sorrow. A doctor once took a sample of my blood and came back to me with a long face. He said he was bringing bad news; he was very sorry, but I had cancer. Bad news? I couldn’t help laughing. When I looked at him, I saw that he was quite taken aback. Not everyone understands this kind of laughter. Later, it turned out that I didn’t have cancer, and that was good news too. The truth is that until we love cancer, we can’t love God. It doesn’t matter what symbols we use—poverty, loneliness, loss—it’s the concepts of good and bad that we attach to them that make us suffer. I was sitting once with a friend who had a huge tumor, and the doctors had given her just a few weeks to live. As I was leaving her bedside, she said, “I love you,” and I said, “No, you don’t. You can’t love me until you love your tumor. Every concept that you put onto that tumor you’ll eventually put onto me. The first time I don’t give you what you want or threaten what you believe, you’ll put that concept onto me.” This might sound harsh, but my friend had asked me to always tell her the truth. The tears in her eyes were tears of gratitude, she said. No one knows what’s good and what’s bad. No one knows what death is. Maybe it’s not a something; maybe it’s not even a nothing. It’s the pure unknown, and I love that. We imagine that death is a state of being or a state of nothingness, and we frighten ourselves with our own concepts. I’m a lover of what is: I love sickness and health, coming and going, life and death. I see life and death as equal. Reality is good; so death must be good, whatever it is, if it’s anything at all. A few months ago I was visiting Needles, the small desert town in southern California where my daughter lives. I was at the grocery store with her when some old friends of the family whom I hadn’t seen for decades spotted me. “Katie!” they called out, and they came up to me, beaming. They hugged me, they asked how I was, I told them, then they asked, “And how is your dear mother doing?” I said, “She’s wonderful. She’s dead.” Silence. Suddenly the smiles were gone. I saw that they were having a problem, but I didn’t know what it was. When Roxann and I were outside the store, she turned to me and said, “Mom, when you talk to people like that, they can’t handle it.” That hadn’t occurred to me. I was just telling the truth. Until you experience death as a gift, your work’s not done. So if you’re afraid of it, that shows you what to question next. There’s nothing else to do; you’re either believing these childish stories, or you’re questioning them—there’s no other choice. What’s not okay about dying? You close your eyes every night, and you go to sleep. People look forward to it; some people actually prefer that part. And that’s as bad as it gets, except for your belief that says there’s something else. Before a thought, there’s no one, nothing—only peace that doesn’t even recognize itself as peace. What I know about dying is that when there’s no escape, when you know that no one is coming to save you, there’s no fear. You just don’t bother. The worst thing that can happen on your deathbed is a belief. Nothing worse than that has ever happened. So if you are lying on your deathbed and the doctor says it’s all over for you and you believe him, all the confusion stops. You no longer have anything to lose. And in that peace, there is only you. People who know that there’s no hope are free; decisions are out of their hands. It has always been that way, but some people have to die bodily to find out. No wonder they smile on their deathbeds. Dying is everything they were looking for in life: they’ve given up the delusion of being in charge. When there’s no choice, there’s no fear. They begin to realize that nothing was ever born but a dream and nothing ever dies but a dream. When you’re clear about death, you can be totally present with someone who’s dying, and no matter what kind of pain she appears to be experiencing, it doesn’t affect your happiness. You’re free to just love her, to hold her and care for her, because it’s your nature to do that. To go to that person in fear is to teach fear: she looks into your eyes and gets the message that she is in deep trouble. But if you come in peace, fearlessly, she looks into your eyes and sees that whatever is happening is good. Dying is just like living. It has its own way, and you can’t control it. People think, “I want to be conscious when I die.” That’s hopeless. Even wanting to be conscious ten minutes from now is hopeless. You can only be conscious now. Everything you want is here in this moment. I like to tell a story about a friend of mine who was waiting for a revelation just before he died, saving his energy, trying to be completely conscious. Finally his eyes widened, he gasped, and he said, “Katie, we are larvae.” Profound awareness on his deathbed. I said, “Sweetheart, is that true?” And the laughter simply poured out of him. The revelation was that there was no revelation. Things are fine just as they are; only a concept can take that away from us. A few days later he died, with a smile on his face. I had another friend who was dying and felt sure he knew when his last moment was coming. But we die at exactly the right time—not an instant too soon or too late. This man was intent on doing the Tibetan Book of the Dead thing, and his friends had promised to come to his bedside and do the rituals from the book. When he called them, they all came, and they went through the rituals, and then he didn’t die. They went home, and a few days later, once again, he was sure he knew when his last moment was coming, the friends showed up, they did all the rituals again, and again he didn’t die. The same thing happened two or three more times, and finally everyone was thinking, “When is this guy going to do it?” They had been called so many times! It was like the boy who cried wolf. He asked me if I would be there on such-and-such a day for so many hours, and I said, “If I can get there, I will.” But as he was dying, finally, the people he left in charge didn’t even bother calling me. It wasn’t the way he’d planned; it was perfect instead. Oh, stories—I love them! What else is there?